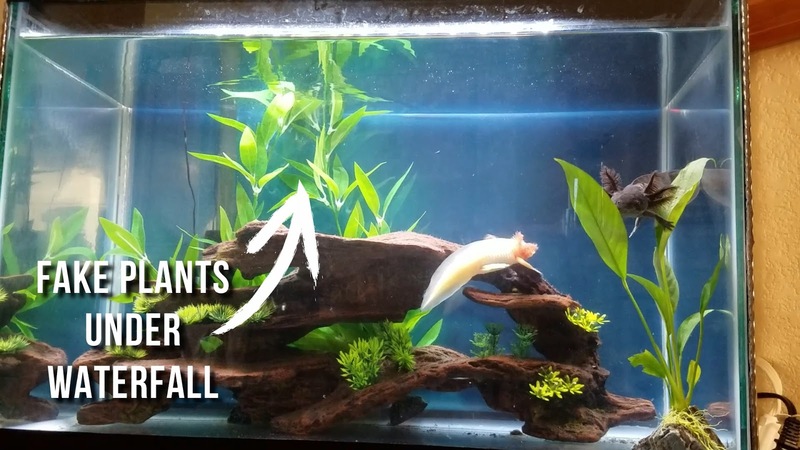 Is your betta fish struggling to swim because of fast current or are your axolotl’s gills curved forward from the strong flow? Many types of aquarium pets – like gouramis, puffer fish, baby fry, and angelfish – are more comfortable in slower waters, and without the appropriate living conditions, your pet may become sick from the stressful environment. Keep reading as I share 5 easy ways for reducing your filter’s flow! If you really want to go for the gentlest flow, use a sponge filter. Remember that you must also install it with airline tubing and an air pump, but oftentimes the air pump also comes with a dial to let you adjust the amount of air pressure. 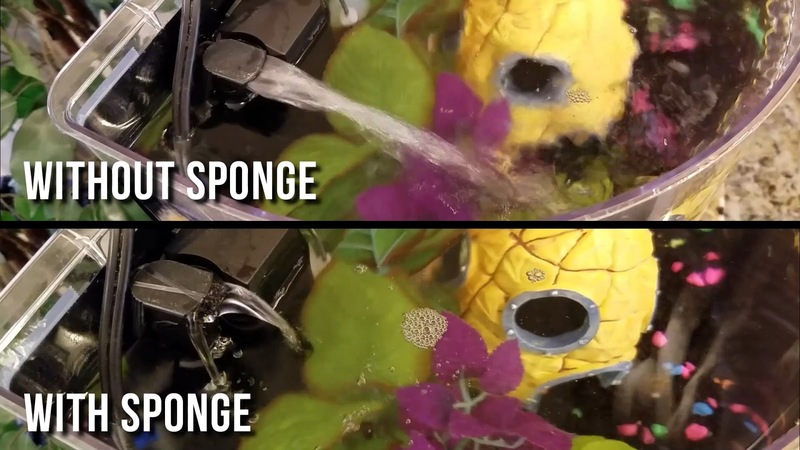 For the gentlest flow, use a sponge filter and your baby fish fry will thank you for it! If you got an aquarium kit, the default filter it comes with may be too powerful for bettas, axolotls, and other slower water animals. Some people will cover the input of the filter with pantyhose or sponge to lower the flow. While this can be helpful for preventing betta fins from getting sucked in, be careful about restricting the inflow too much because you don't want the filter motor to burn out. For example, if you're going to use a pre-filter sponge on the input, get a coarser one so it won't get clogged as quickly. Rather than blocking the input, it's better to block the output instead using a baffle, which is simply anything that blocks or redirects the water flow out of the filter. You can stuff a small piece of sponge in the output nozzle and attach it with rubber band or fishing line. Or you can cover the output nozzle entirely using a pre-filter sponge. If you have a hang-on-back filter, you can still block the waterfall outflow by covering it with a sponge or craft mesh. You can attach sponge on the filter output using rubber bands, sewing thread, or fishing line. If your filter has an output nozzle, you can aim the stream toward the water surface or back wall of the aquarium to dispel some of the water's energy. 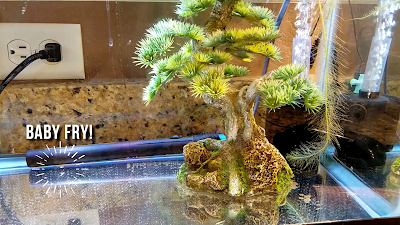 For hang-in-back filters with a waterfall outflow, many betta forums commonly recommend covering it with a disposable water bottle. However, if you're having trouble getting it to stay attached, try placing a plastic soap dish container or shower caddy with suction cups under the waterfall. 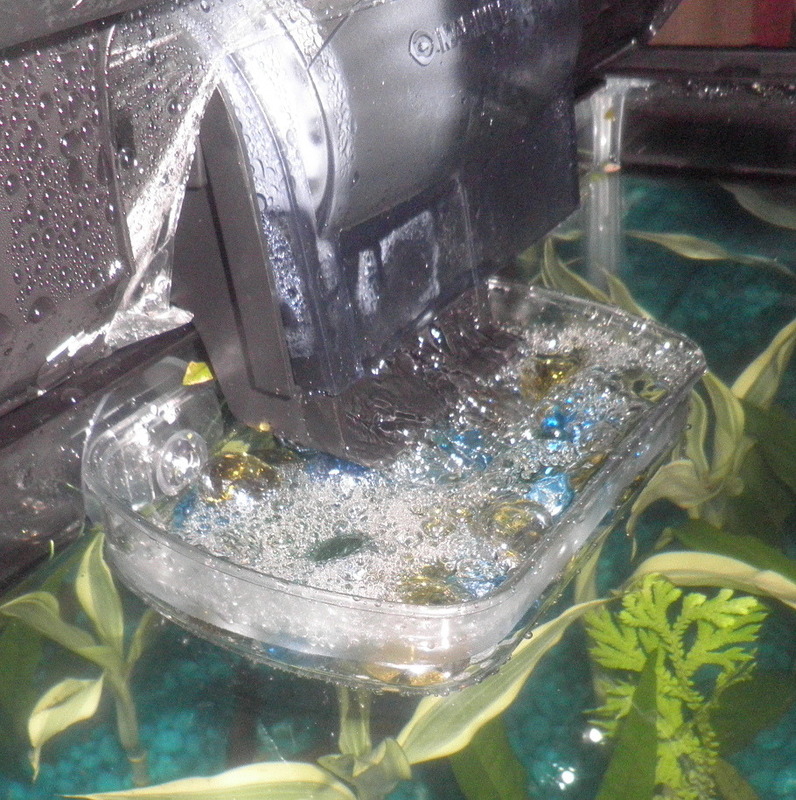 You can fill the plastic dish with glass marbles, sponge, or even live moss to dispel the flow. The great thing about this method is that you can reduce the current without affecting the turnover rate. Speaking of live moss, you can also place live plants or decorations right under or in front of the output. Not only does a lot of aquarium decor break up line of sight for aggressive fish, but it also breaks up the current swirling around the fish tank. Finally, you can disperse the pressure of the output by using a spray bar with lots of holes along the tube. Again, the spray bar can be aimed toward the aquarium back wall or toward the water surface to reduce energy. Some nano tanks like the Fluval Spec or Top Fin Retreat have a filter compartment where a small pump is connected to a flow tube to reach the return nozzle of aquarium. You can drill holes in the flow tube to reduce the pump pressure even further if needed. Depending on your setup, you may need to combine several of these methods in order to sufficiently bring down the flow, but it's definitely worth it and your betta fish, axolotl, and other aquatic pets will thank you for it! Do you have a good way to reduce filter flow? Comment below to let me know and to share your experiences with everyone. Don’t forget to take time to enjoy your aquariums and I’ll see you next time!